I was recently cornered approached to be the room parent for my daughter's fourth grade class. Of course I couldn't say no. No other parent had volunteered and if I didn't do it, a school employee would have to do it. I really don't mind doing it. Just seems like it all worked out to have a ton of things to be done on the same day. I have a wedding that my whole family is in for my sister-in-law, our teacher's birthday, and donations for a holiday basket for the school fundraiser that is all supposed to be done on the same day! I know I'll get it all done, but I always seem to overfill my plate. 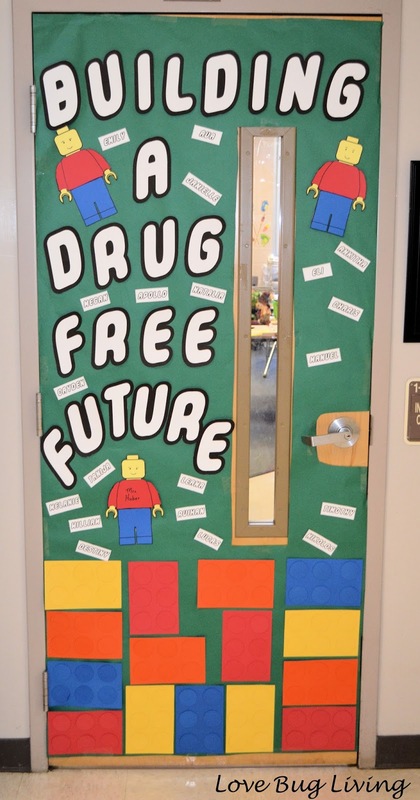 Next week is Red Ribbon week at our school. This is a drug awareness event that they use to incorporate fun activities into a anti-drug theme. 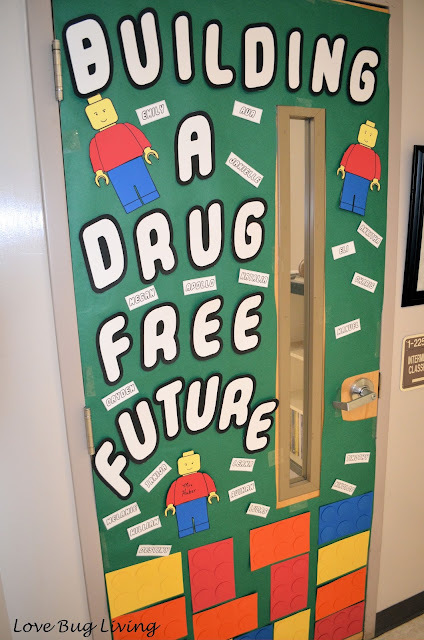 The room parent is supposed to decorate the class door to promote a drug prevention theme. I've never decorated a door before, but I think it turned out great. I started browsing Pinterest and told my daughter about some ideas I saw, but she told me some of those ideas were already in the school halls. Soooo, back to the drawing board to make up an original idea. 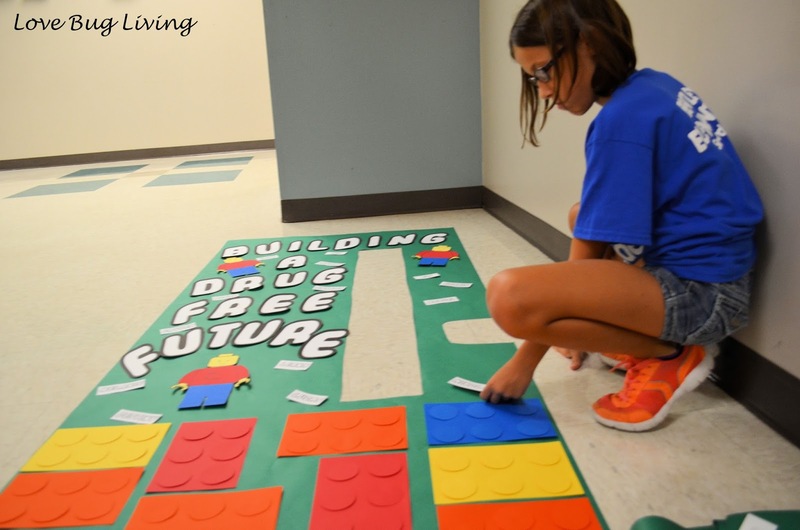 That's when I came up with the Legos and the quote Building a Drug Free Future. To create my Lego letters, I downloaded the Legothick font Here. I typed my quote out on Word and printed it onto cardstock. The letters were pretty easy to cut out since they are more bubbly in shape. I found my Lego man Here. I printed him on yellow paper. I also made an extra copy and cut the pieces out to use as patterns to make my guys shirts and pants. I traced my patterns onto colored cardstock, cut them out and glued them on my Lego guys. I wanted the class to all be part of our door as well, so I used my Legothick font to print out a text box on Word with each of their names in one. I printed them out on cardstock as well. To make my Lego blocks, I cut my cardstock sheets in half to make two blocks. 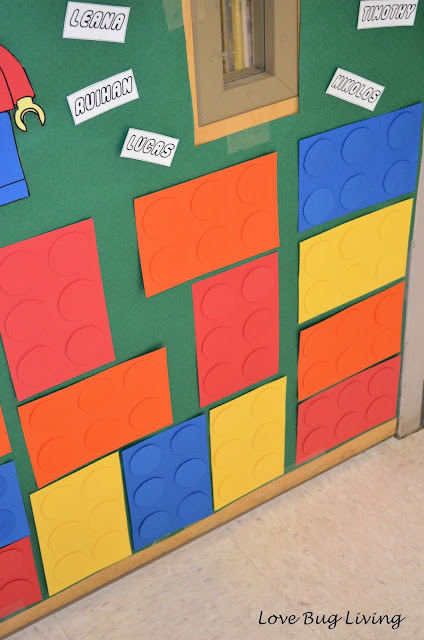 If you have a 2 inch hole punch, that would probably be great to use to cut your block circles. I'm too cheap to buy one, so I traced and cut out my circles by hand. It really didn't take that long, but we've already decided that I'm a glutton for punishment. I used foam dot stickers to adhere the circles to the blocks. This helps them stand out a little and look a bit more like real Legos. I'm not sure if I was supposed to put the door decorations all together in the middle of the hall, but all the kids (and teachers) that passed seemed to like it! First duty as room parent done! Hopefully I will find out more about what I'm supposed to be doing tomorrow at my first meeting! Creative and amazing idea. I will try to make it here in Costa Rica. :) Thank you for sharing.